The Magnificent Monopostos is the final installment of a trilogy that begins with The Immortal 2.9 and continues with The Legendary 2.3, tomes on the Alfa Romeo 8C2900 and 8C2300 cars, respectively. 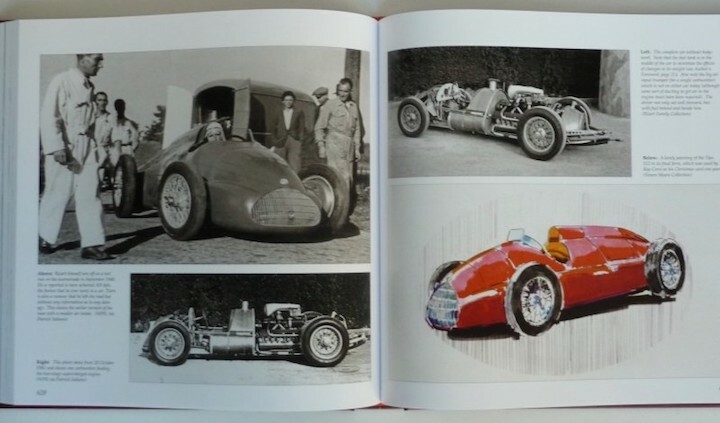 Unlike the first two parts of this trilogy, Monopostos is devoted exclusively to motor racing and covers a wide range of cars fielded by Alfa Romeo in its pursuit of success on the race track. 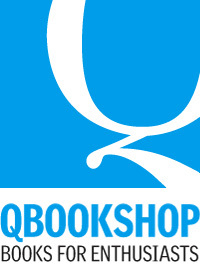 Like the first two books, the quality of the two volumes of Monopostos is of the highest quality. These are Serious Books, weighty, thanks to the heavy, high-quality paper that makes the reproduction of photographs little short of stunning, this heftiness of words and pictures lending an air of authority and substance. An effort such as this demands respect and even veneration. There is nary a discouraging word to be heard regarding Simon Moore or Monopostos. In an interview with Pete Vack, the editor of Veloce Today, which appeared in the February 2014 issue of Vintage Roadcar/Vintage Racecar, Moore comes across as the sort of person one would not mind spending some time with, personable and erudite. In addition, those I have come in contact with who have worked with Moore over the years all speak very highly of him. That in the Acknowledgements Moore lists the literally hundreds of people who provided help in some form, great or small, to the massive research effort so necessary for such a massive work says something of his generosity. Not everyone, sad to say, does this. Monopostos is spread over two volumes and some 800+ pages, with over 1100 photographs, most gathered in in one place here for the first time. It is, to put it mildly, a stunning piece of work. One can easily sense the lust it arouses in those who collect such works. Which raises the question that Woody Guthrie and sign prompted when I first surveyed this book: just who is it made for? You and me? Or those responsible for what is on the other side of the sign? I have read (after skimming them over time) the other two installments in Moore’s trilogy: The Immortal 2.9 and The Legendary 2.3. 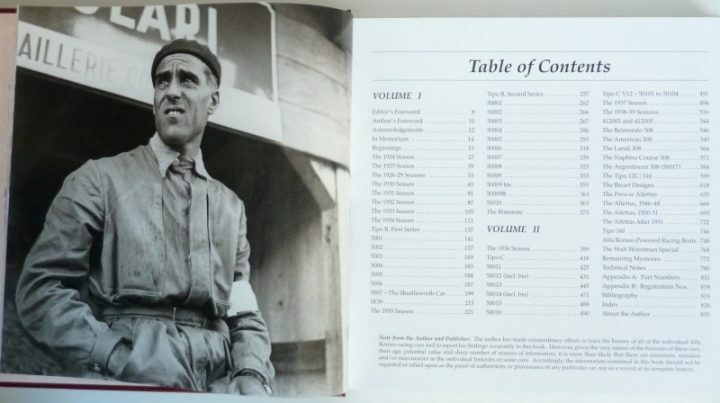 This is thanks to the International Motor Racing Research Center located in Watkins Glen, New York, having copies of those tomes in their collection. However, although they are still available (I think) from the publisher** for $275 and $295, respectively, postpaid, unless I either come into a significant influx of extra money or I become suicidal (it should be noted that She Who Must Be Obeyed does not have much a sense of humor at all—make that none—when it comes to such things), it is highly unlikely that these gems will ever join Monopostos on my bookshelf. The reaction to the fact that I shelled out what must be regarded as a not insignificant fortune for Monopostos made me seriously regret that I had turned in my body armor when I left the Army. I came very close to needing it. So, why did I part with $395? To this day, I am really not sure. I am not even certain that it seemed to be A Good Idea At The Time. It was not necessarily that I was impressed with the other two installments of the trilogy, as blasphemous as that admission might be. Yes, I certainly admired Moore’s interest in the 8C2900 and 8C2300 cars and his dogged research during which he dug up one thing after another. Yes, I genuinely admire the examination of artifacts and efforts to both “tell their stories,” as they say, and then attempt to place them into context. But, it seemed to be clear that such works were obviously aimed at only those who seemed to be on the board of Goldman Sachs or had several villas scattered around the world or simply who could afford to purchase, today, an 8C2900 or 8C2300 in the first place. I think it’s safe to say that I bought Monopostos on an impulse or, more likely, a moment of Why Not? While I might not have what could be called an intense interest in either the 8C2900 or the 8C2300, I do have something of an interest in the Grand Prix machines of Alfa Romeo. So, I think that I simply succumbed to temptation and risked the ire of the Colonel’s Daughter, the other incarnation of She Who Must Be Obeyed. 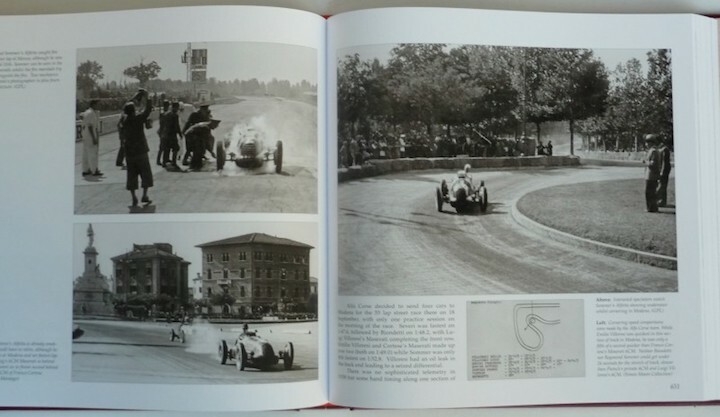 Moore chooses an interesting method with which to divide the two volumes, one that in all honesty probably would have never occurred to me: the suspension system is used as the dividing factor, with the “cart-sprung” machines being replaced by those with independent suspension for the 1936 season, which becomes the opening season for the second volume. It is best to think of Moore and his (and Harris’ for that matter) The Magnificent Monopostos as more of a personal interpretation or tale than as an historical narrative or interpretation of the machines. This crops up at times in various ways. 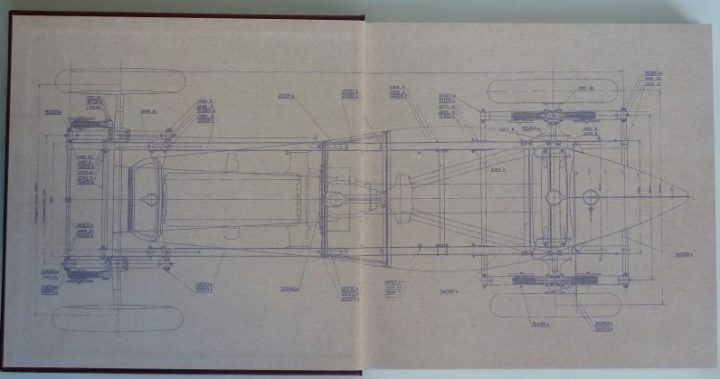 Although one might think that the inclusion of the ALFA racing machine from the 1914 season would certainly be germane to the topic, Moore seems to only grudgingly include it, along with the RLTF from 1923. Certainly, this is a nit that could just as easily not be picked. It is also very easy to see that had Moore stuck to his original intention of focusing literally only on the monopostos, there would have been at least a sizable slice of context excised from the tale. There is also the occasional reminder that Moore is quite aware that this opus is a trilogy and that he (and Harris) clearly assume that the other two installments are easily at hand. For instance, the discussion of the 1933 season opens with Moore noting that since he had already covered the early part of this season elsewhere (i.e. in The Legendary 2.3) he sees little reason to spend much time discussing it again and devotes a mere sentence or two to this aspect. But since I did not have a copy of the other book/s I was left wondering just how Moore would have described the affairs of this part of the season. Perhaps this is just a very minor point, with Moore’s decision to skip it being entirely correct, and even with this sort of pruning, Monopostos is after all already weighing in at over 800 pages. As with most works in the motorsports genre, in Monopostos there aren’t any foot- or endnotes. In this personal narrative, Moore does strive to give credit to the various works and authors or researchers that he cites, which in many, many instances allows one to both get a sense as to where Moore got his information as well as gain a sense of how his reading material may have shaped his interpretations of the topic. While this did raise an eyebrow on more than a few occasions, given the source, it also was much appreciated because it pointed the way to unfamiliar material. For many, I would suggest that it is either the Tipo B’s or the Alfettas, the Tipo 158, and the later 159s that would draw their interest. Both receive very detailed and almost exhaustive attention, of course. But, I will admit that I found the discussion of the Tipo C just as interesting, in large part thanks to these machines not being given as much attention as the Tipo B’s and the Alfettas. Once again, I discovered that my ignorance was exceeded only by my lack of knowledge when it came to the Tipo C.
The discussion of the Alfettas, both pre- and postwar, covered ground that was both familiar and not so familiar. In the case of the latter, this was certainly true for the prewar Alfettas. Moore provides some information regarding the cars and the team that did raise an appreciative eyebrow on several occasions as well as more than a few head nods and even the “Aha!” a time or two when a few dots were now connected. The tale of how Michel Poberejsky, who raced until the nom de course Mike Sparken, came to own an Alfetta provides a bit more to what transpired than other versions I have read in the past. Yet, when all is said and done, usually rather well in that Richie Rich sort of way that the publisher ensures is not overlooked, I keep looking at what that the side of the sign opposite the one that Woody Guthrie and I like says. 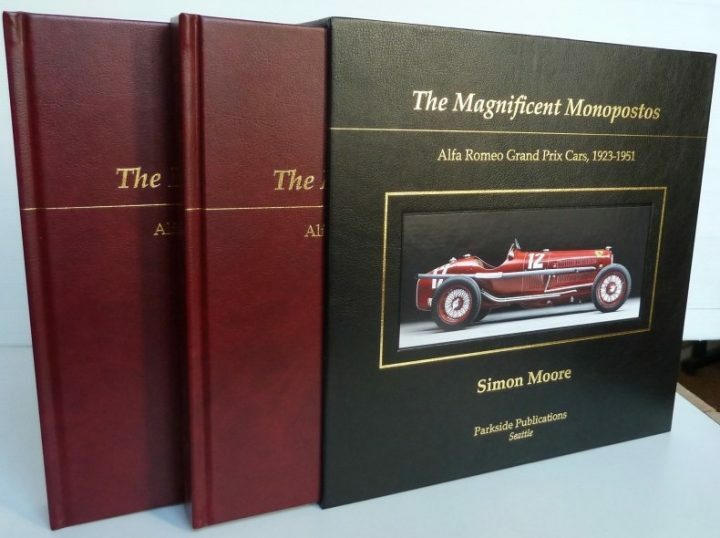 As wonderful and marvelous as The Magnificent Monopostos: Alfa Romeo Grand Prix Cars 1923-1951 might be, is it really the sort of book made for you and me? It is really for the One Percenters and not for those of us belonging to the bourgeoisie or the petit bourgeoisie, much less those being mere proletarians or plebeians. Sorry Simon, I know you mean well, but . . .
Only just over 1000 copies have been printed. Voted “Motoring Book of the Year 2015” by the Royal Automotive Club and “Publication of the Year 2015” by the International Historic Motoring Awards Committee. 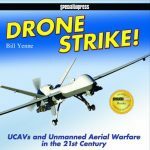 ** Parkside Publications: I am not cheap, but I could be had . . .